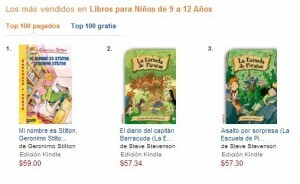 What is popular in Spanish in Amazon today? 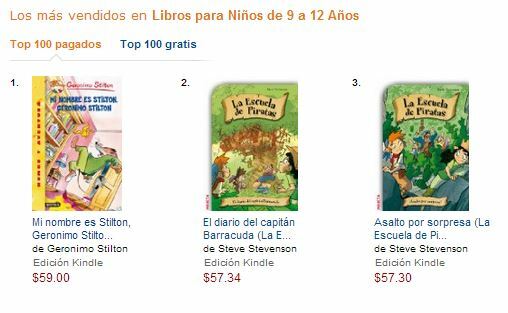 May 24th, 2014.- What is popular in Spanish in Amazon today regarding YA and Children’s eBooks? This is a little report that I hope I can bring to you periodically, so you will have more information to decide how your own book could do in Spanish. A word of warning, though: I will only talk about some eBooks and I will certainly not cover everything that is out there. In the first place of the list in Amazon Mexico we find “Divergente” the Spanish translation of “Divergent“, written by Veronica Roth. “Divergente” is the first part of a trilogy, now completely available in Spanish. 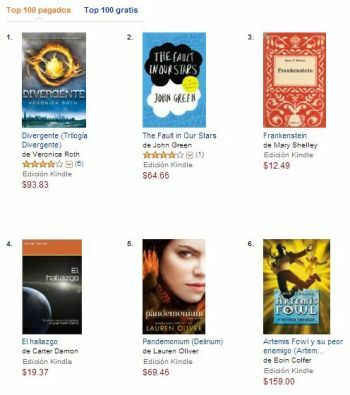 The trilogy is certainly selling well in Amazon Mexico and what is more interesting is that the eBooks in Spanish seem to be a good marketing vehicle to promote the eBooks in English, since the “The Divergent Series Complete Collection“, available only in English, is also a hit in Amazon Mexico. My guess is that Latin American fans who have read the Spanish version also buy the English Collection to re read the stories and find out if they missed something. Veronica is also at position number 12 in the Mexican list with her book “Four: The Transfer: A Divergent Story,” available only in English. In place number 4 today I found “El hallazgo,” a science fiction book written by a Carter Damon. Oddly enough, I did not find any books in English from Carter Damon. Could he be a Latin American writer using a pen name? I don’t know. This eBook seems to be an adventure dealing with an intergalactic war. One of my favorite stories ever, Maze Runner, by James Dashner, is always doing well in Spanish. Today he appears in position number 13 in Mexico, but he is constantly in the top 100 with one book or another. As is the case with Divergent, most of the Maze Runner titles are available in Spanish, nurturing a new market of Spanish speaking fans in all Latin America. In number one in the 9 to 12 years old children category, we find the Spanish version of good ol’ Geronimo Stilton. Geronimo has carved himself a nice little niche in the Spanish market, specially since he does not appear in the same place in Amazon US, where the first place is occupied by… Rush Limbaugh?? God, I think I will stick with the Latin American Market. Finally, one of my favorite books, “No me lo vas a creer” by talented Alicia Molina, is popular in Spanish in Amazon today. I have only read Alicia in Spanish and I could not find her books available in English, but to me, she constitutes an excellent example of what is being produced today in Spanish for Children’s books. “No me lo vas a creer“, which could roughly be translated to “You will never believe this” tells the story of Juan, a kid who is always late to school, but who always has an incredible story to justify his tardiness. Do any of these eBooks sound like something you have today in English? Do you see yourself or your books in the Latin American market? This entry was posted in Children books, Popular in Spanish in Amazon today, Spanish eBooks and tagged Amazon, Childrens, Popular, spanish, YA on May 24, 2014 by Jose Luis Cortes.